William Cook was born on 31st December 1815 by his account although Parish Records show him baptised on 12th February 1815, the fourth child and third son of John and Susanna Cook. His father, JOHN, was a mariner and smuggler and William followed in his footsteps, at least in the early part of his life. William was just six when his father drowned on the last voyage of the smuggling cutter “Jane”. At that time there were six children ranging from age sixteen down to the baby who was just a few weeks old. Along with many other families they were dependent on the parish and were well looked after by the Vicar, Parson Pearce. William married Sarah Ann Hall in 1843 and they had one daughter Mary Ann later that year. Mary Ann married Charles Philpott in 1864. 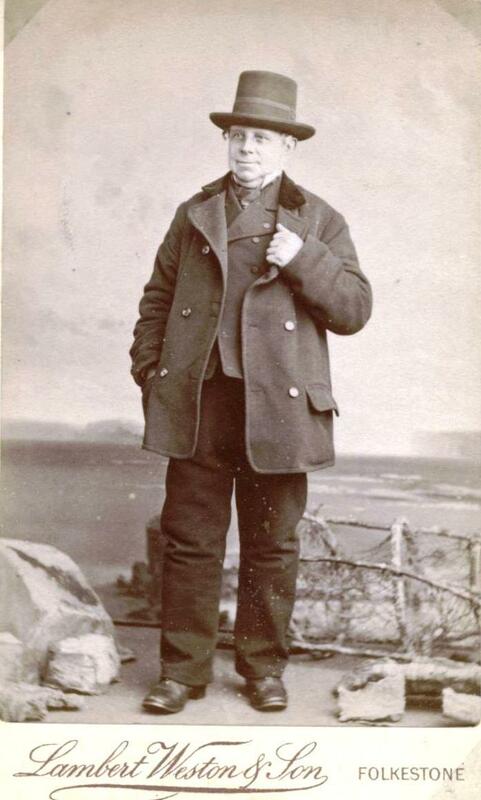 Later in life he became part of the Temperance Movement and was a founder member of the Band of Hope in Folkestone. His life is probably best described by the articles which appeared about him after his death and by the enormous funeral procession which accompanied his burial. He appears to have been much loved by everyone and espcially by the children of the town. William Cook, the old Folkestonian mariner known by the familiar title of “Cookie” to everyone who claims to be acquainted with the most noted amongst our townsmen, died on Saturday last in the 73rd year of his age, after a short and painful illness. Mr Cook was a man who had enjoyed the most robust health, and his appearance was that of a weather–beaten old salt, whose physique would stand many a further year of this world′s “wear and tear,” but he fell victim to the insidious effects of cancer, and disliking the idea of any operation being performed upon him, he cheerfully resigned himself to his fate, and passed away after intense suffering in the simple hope and faith of a Christian, his death being consistent with his well spent life, and an example also to those around him. “Cookie” was one of nature′s noblemen, equally liked by old and young, rich and poor, the circle of his acquaintance extending to all classes. Ever ready with a helping hand to the young, by offering plain words of earnest admonition, and as definite in administering an honest rebuke to the foolish and profligate carrying himself with dignity and directness of purpose in the society of all. “A word in season” was the motto indicating “Cookie′s” way to do good, and he had the intimate sense of knowledge of the time when to hold his tongue, and pass on with a sigh or a word of pity. As a young man, according to hid own testimony he was “as wild as anybody,” but for half a century he had been identified with Temperance work, and the religious instruction of the sea-farer. Amongst his co-workers here were the late Councillor Willis, and the late Mr. Thomas Mummery, who with others were the principle pioneers of the tee total movement in our locality, as well as leaders in the circles of Nonconformity, being attached to the Independents or Congregationalists. Ten years ago William Cook was included amongst Christian workers in a series of articles which appeared in the British Workman, and his portrait was published amongst the admirable wood engraving for which that magazine has always been noted. 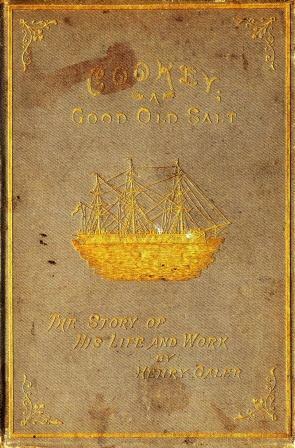 He was there depicted in the cabin of a collier, where he was in the act of supplying the crew of the vessel with books to be placed in his library bag, an invention of his which he furnished to ships for the charitable and useful purpose of a circulating library, and which he kept replenished with fresh books every voyage. But the special work with which “Cookie′s” name will be handed down to posterity was his regular attention to the wants of Sunday school children, and the wonderful affection which existed between him and the last two or three generations of little ones of the east part of Folkestone. Every Sunday morning he had a certain round which he took for distributing pictorial card, leaflets, and little books, and the anticipation of this visit each week might have been seen by the children waiting at their respective doorsteps to greet Mr Cook, and to receive the little gift and cheery words of the kind old man – many of the children always clinging round him on his journey through the streets. On Sunday afternoons also it was an understood arrangement that at a certain hour “Cookie” was to be found on the Dover Hill above Junction Station, where he was employed in distributing tracts and books to whoever passed in that direction, and it was an undoubted fact that he was most successful in winning his way and making his gifts acceptable even to the roughest he might chance to meet. In truth “Cookie” was above all things a model tract distributor. In matters of controversy regarding religious questions, he was always ready with most simple dogmatic arguments, and as these sufficed for him, it therefore appeared to “Cookie” that they ought to satisfy others. He had probably given “a bit of his mind” to teachers of most denominations, and was ready on occasions to relate his experiences in this direction. He used to tell a Yarn respecting the way in which the Vicar of Folkestone, the Rev. M. Woodward, on a certain occasion took opportunity to impress “Cookie” with the idea that he (the Vicar) was the Shepherd appointed to the cure of souls for the Parish of Folkestone. “Sheppard, Mr Woodward? Why then let me be your Sheep–dog!” “But we could not agree” would be the concluding words of this story. The idea of such a shepherd having such a sheep–dog was rather comical and certainly suggestive of incongruity, but it never seemed to strike “Cookie” in that light. A few years ago when the enlargement of the Congregational Church was under discussion, it was suggested by some of the building committee that a certain gallery would not be required – “Oh give us a gallery, Mr Palmer” said Cookie, “sailors always like to go aloft,” and it was at once decided to have a gallery, and we believe that it has been greatly appreciated by the seafaring portion of the congregation. On attaining his 70th year, a movement was set on foot to present Mr Cook with some mark of the esteem in which he was held by his more intimate friends, and the result was the presentation of a purse of £10, a pair of gold spectacles, an easy chair, a portrait, and other suitable gifts including the embellishment of an open Bible, on which could be read “The hoary head is a crown of glory, when found in the way of righteousness” and an illustration of “The cottage home of William Cook.” On the occasion of this presentation at the Congregational Schools Mr. S. C. Weston occupied the chair, and amongst those who took part in the enthusiastic proceedings, were Rev A J Palmer, J Clark, Esq., J.P., Mr Kerr and a host of friends belonging to the town, and the acknowledgement of these gifts by “Cookie” was a characteristic oratorical treat never to be forgotten. The following effusion was a notable feature in proceedings. T′ cheer and bless, he′s done whate′er he could. And well they know ‘twill hallowed be by prayer. Live to cheer and sooth him in declining day. William Cook′s surroundings were always remindful of hard work and indomitable industry. On the beach in the season he was for many years a well–known boatman, numbering among visitors many who prized his friendship, and as a gardener in a modest way he was specially noted, the cabbage garden in the lower Sandgate road, opposite the Switchback railway, always well cropped, used to be a favourite rendezvous for those children who were privileged to enjoy his closest friendship; and on building his “cottage home” at Bowles–well, it soon became luxuriantly surrounded with trees and shrubs converting the open meadow into a trim, well kept abode. It was here with his wife, that he spent many of his latest years, and it was here with the loving care of his faithful partner to tend him, that he died, leaving behind him the vivid memory of an honest useful life, and a vacancy in our local annals which it will be difficult to refill. On Wednesday afternoon, the mortal remains of William Cook were taken to their last resting place in the Folkestone Cemetery, amidst the general and genuine tokens of sorrow sympathetically participated in by all classes of his fellow townsmen, an official expression of which was shown by the hoisting of the “Union Jack” hoisted half–mast high at the Town Hall. Messrs Prebble were the undertakers, and in a coffin borne upon the open hearse, and covered with beautiful wreaths of flowers, the body of dear “Old Cookie” was taken from his residence in Dover Road through the streets of his native town, by way of Rendezvous Street, Sandgate Road, Manor Road and Cheriton Road, to the cemetery. Three carriages followed containing his relatives and nearest friends, behind whom walked many members of the Good Templar Lodges, wearing their regalia, and hundreds of Sunday school children of the Congregational and other schools with their teachers; while the streets and roads were lined with those who were the general acquaintances of the deceased, consisting mostly of women and children, all mourning the loss of a near and dear friend. Every sign of heartfelt sorrow was seen on the route and the crowd became thicker and more dense as the cemetery was reached. The scene around the grave was most impressive. An irregular square was formed, the inside fringe of which consisted of masses of children, everyone present taking the liveliest interest in the solemn service commemorating the loss of their old fried, while the chief mourners , members of the family of the deceased, with such old acquaintances as Mrs Willis, the Rev R Willis (widow and son of the late Councillor Willis) and others, stood at the head of the grave, beside which rested the coffin covered with the flowers “Old Cookie” loved so well. Amongst the little group of particular friends, was also Mrs Pledge the Mayoress, holding in her hands a wreath of laurel leaves covered with an anchor wrought in simple flowers, and embellished with streamers of red, white and blue ribands, an appropriate symbol to the worthiness and profession of the brave old sailor; and hardly a child was present who had not brought some little posy or floral gift to place reverently beside the honoured grave. The Rev. A. J. Palmer first gave out a hymn specially for the children, which was heartily sung, the youngsters filling the quiet autumn air with their childish treble in tones that must have reached the “silent land” of the departed. The Rev. R Foster Jeffrey next read the scriptures, “Now is Christ risen from the dead, etc.,” with solemn impressiveness. The Rev. A. J. Palmer then offered prayer and asked for the Devine blessing and help on behalf of the bereaved family. Another hymn followed, and the body was placed in the grave, after which Mr Palmer delivered a most appropriate and telling address, commencing as is his usual wont with a tale. He said that when a Quaker was once asked why they were silent at their burial services, the answer was, it was sufficient to know on such occasions that “the Dead speaketh.” In like manner, standing by the open grave of their dear old friend, he exhorted his hearers to remember the cheery words they so often heard from his lips. Alluding to the last hours of William Cook, the rev. gentleman said he had attended many bedsides in sickness, but had never known a good man to suffer so much pain at the last as did their friend. But his faith triumphed over his sufferings, and he said in answer to an enquiry as to how he felt – “I have fought the good fight I have finished my course, I have kept the faith: henceforth there is laid up for me a crown of righteousness which the Lord, righteous judge shall give me that day.” As the end drew near, holding his hand in mine, said Mr Palmer, the dear old man seemed to catch a glimpse of The Master, as with an effort he said “The old valiant sailor is going to receive his reward; Home, Home, Home,!” These were his last words as he sank back upon his pillow. The Rev. Forster Jeffrey added a brief address at the grave side, and the Good Templars performed their services for the burial of a brother;- and yet when the ceremonial rites were all over, the crowd still lingered round the spot which now marks “Old Cookie′s” grave. Surprisingly there is an error in the inscription on William Cook′s grave. 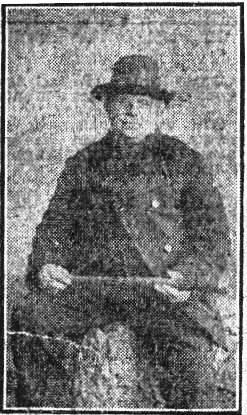 His wife was Sarah who died 1914. Mary Ann was his daughter. On Sunday afternoon his little friends, to the number of several hundreds, were privileged to take a last look at the poor old man′s peaceful face, and many of them carried flowers, which they deposited in the coffin. The funeral took place on Wednesday when it is estimated that four or five thousand people were present in the Cemetery. Nearly 1,500 children (the schools of the town being closed for the afternoon) attended in procession as well as many adults, good templars, and friends. The Mayor caused the flag on the Town Hall to be lowered to half-mast, and he and the Mayoress sent a wreath composed of ivy and laurel leaves, an anchor of corn flowers, tied with red, white and blue ribbon, to lay upon the grave. Many other friends also sent floral wreaths in token of respect and regret. On Sunday next the Rev. A. J. Palmer will preach a memorial sermon at the Congregational Chapel. To cheer and bless, he′s done whate′er he could. And well they know ′twill hallowed be by prayer. A few weeks ago he caught a cold which developed into congestion of the liver, and was the immediate cause of death. He was quite conscious till the last, and exclaimed just before his death “Home! Home! Home!” A very large number of children visited the body on Sunday afternoon. An eloquent address was delivered by the Rev. A. J. Palmer, touching on the life of the deceased. A memorial service will be conducted at the Congregational Church on Sunday evening by the Rev. A. J. Palmer. The deceased was the oldest member of the church. On Saturday placards were posted inviting children to attend a service at the exhibition, in memory of William Cook, the seamen′s missionary and the children′s friend. Several hundreds attended, but there were more adults than children in the meeting, which was held in that part of the exhibition used for concerts and entertainments. In the other portion, where the Japanese refreshment stall stands, with a lot of rustic tables and chairs, a host of little ones were enjoying themselves, and were apparently quite oblivious of the fact that a solemn service was being conducted beyond the screen. If the spirit of old Cookie could have visited the exhibition he would certainly have been among the graceful palms and smiling little ones who were spending a pleasant hour in the great hall. On the platform, among others were the Revs. W Hall, A. J. Palmer and R F Jeffrey, Messrs John Holden, E.J. Holden, Logan, Willis &c. A hymn, “Over There” was sung, and the Rev A.J. Palmer offered a brief prayer, after which he asked Mr. John Holden to take the chair. Addresses were delivered by the Chairman, the Rev. R. F. Jeffrey, the Rev. W Hall, Mr. Logan, Mr. Willis and Mr. C J. Holden, the proceedings lasting about an hour. By the kindness of the directors of the Pleasure Gardens Company, the Exhibition Building was on Sunday afternoon lent for a special “William Cook Memorial Service for Children.” The service was commenced about three o′clock, but long before that time the great building began to fill, and by the time the Rev. A J. Palmer announced the opening hymns it was crowded to its utmost capacity. Nearly two thousand children and adults gathered to do honour to the memory of William Cook, “The children′s friend”. On the platforms were the Revs. A.J. Palmer, R Foster Jeffrey, W Hall, J. B. Benneworth and R Willis and Messrs J Holden, J.P., J Jenner, T Logan, E. J. Holden, and Richard May. The service was commenced by the singing of “Cookey′s” favourite hymn, “O think of the Home over there,” and the Rev J. B. Benneworth then offered prayer. Another hymn, one well loved by the ′hildren, “Around the Throne of God in Heaven” was most heartily sung. Mr John Holden then took the chair as President of the meeting. The Rev R. Foster Jeffrey commenced an interesting speech by saying that he expected some of them were inclined to ask “What meaneth this service?” They knew that the Israelites of old were enjoined to tell their children in reply to that question that the services were in commemoration of God′s goodness and mercy to them. If he understood rightly, they were met together to recall the memory of a good man, and he hoped all the boys and girls present would ever remember that the memory of a good man is blessed. There was no fortune equal to that of the high character won by their dear brother, who had gone to his honoured rest. Let who would be clever, he hoped the boys and girls before him would try above all things to be good. They all knew how their dear fold friend went about with a cheerful face and a pleasant word. Such cheerfulness was partly due to his happy disposition and his splendid health, but, most of all, to the fact that he belonged to Christ and had no doubts or misgivings as to the future. They all knew how beautiful his life was, although he had no great outward gift, unless it was his genius for goodness. How Cookey loved the children the boys and girls present well knew. No one knew or loved so many children as William Cook, and he learned that love from the Master, who said “Suffer little children to come unto me and forbid them not.” There was one trait in William Cook′s character which was less known to most people than his other excellent qualities. He had an intense sympathy with the lowest of the low, and many a time he had spoken with tears of sympathy of the poor tramps who passed his little cottage on the hill on their way to or from Dover. If he were here that day he would tell him not to talk about him, but to talk of the Saviour. Oh might all the boys and girls present try to lead such a life as Cookey had lived. At a Quaker meeting an old and venerable man said they were often told that it was a solemn thing to die, but he could tell them it was a more solemn thing to live, and that was why they wanted every boy and girl to live the life of faith through the grace of William Cook′s Saviour. His exemplary Christian character, his intense sympathy with the poor and needy came from his being in Christ, and he would urge all his hearers to seek the same Saviour, so that they might see their dear friend in the beautiful home to which he had gone. The Rev. W Hall having addressed the assembly, Mr. Logan addressed a few words specially to the children. He said he would like to know how many cases of conversion to God had been the outcome of good old Cookey′s work. He was sure that they might be numbered, not by tens, but by hundreds, and some of the books given away by the old man had done an endless amount of good. In addressing himself to the teachers and other adults in conclusion, Mr Logan said Cookey had no great outward attainments, he was humble, and even ignorant, but his life had been such as to bring that great crowd there to honour his memory; it was one more reminder that true greatness was not the result of riches but of goodness. The Rev. Richard Willis next addressed the children, claiming that he specially represented the girls and boys as all round him on the platform were “old men” while he had only just come to man′s estate. Some people contended that giving good books to little children was useless work, but he could tell them that during his short ministry two bright little boys had given testimony before they died that they were going to be with God. When he (the speaker) used to go up the Dover–road he always tried to get a book with a picture, because he didn′t like the dry old books without pictures, and he found out that the way to get a picture book was to go with the old man right up to the double gates, and then sometimes you would get two, whereas if you only went as far as the “Railway Bell” you got a book with no picture at all. He often thought there was a lesson to the children to persevere in that simple way Cookey had of distributing his best books to those who persevered longest. Mr John Holden said it had been suggested that a practical proof of the children′s love for Cookey should be given by their providing a tombstone out of their own tiny offerings. There would be no difficulty in raising a headstone, but they wanted the children to do it all by themselves, and if they had come out without a penny that day they could leave it at Mr. Logan′s or torment Mr. Palmer when they saw him in the streets. He was sure the children could raise the memorial to their old friend all by themselves. The old favourite Sunday School hymn “Here we suffer grief and pain” was very heartily sung, and the Rev. A.J. Palmer having pronounced the benediction, the vast concourse of children and adults who had assembled to honour the memory of Cookey, dispersed. From Heritage Room Library. Newspaper cutting, no date nor paper given. So much for the present generation now let us turn back the pages of memory to the days when the Blue Ribbon Army flourished in Folkestone. Those of my readers who are getting on in years will remember those days and will remember too “Cookie” the founder of that Army. “Cookie” was Mr William Cook who lived for many years in a little cottage on Dover Hill. He was a great temperance man and his meetings in the fishing quarter of the town drew great crowds. He had a lusty voice and often as not his speeches consisted largely of songs which he sang with unwonted vigour. In his lifetime he gave away many thousands of tracts and religious booklets to children who seemed to have a special liking for him and he for them. To be a sober man. The last line “Cookie” roared at the top of his voice. If you go into Folkestone cemetery along Cheriton Road you will see there “Cookie′s” gravestone. 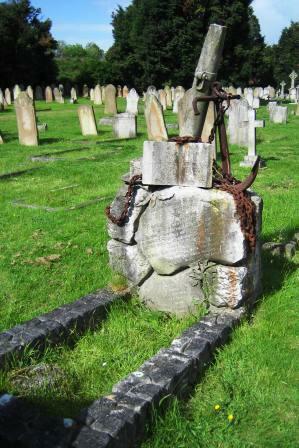 It is a striking piece of masonry for it is in the form of a rock with a broken mast rising behind it, an anchor and chain, an open book, a replica of the box in which cookie kept his little blue ribbons – and “Cookie′s” old hat, a copy in stone of the very hat that you see him wearing in this picture. When he died in 1888 thousands of people followed the coffin to the grave. During his life a book was written about “Cookie” but whether he wrote it himself or someone else wrote it for him I am not quite clear. However, I am very anxious to have a copy of the book, and if any of my readers has one I should be most grateful for the loan of it. So far I have not been able too find one anywhere in Folkestone. I have been lucky enough to be sent photographs of the Book “Cookey; A Good Old Salt” A Story of his Life and Work by Henry Galer. This confirms the accounts given above and the story of William's father, John Cook as the smuggler who died aboard the “Jane”. I would like to thank Sandra Rittmanic for sending additional newspaper articles and information on William Cook. I would like to thank Jane Newman for photographs of the book of Cookie's life.